How do I restrict my referral program so only customers who have previously ordered from me can send referrals in my WooCommerce store? Click WooCommerce and click Referrals in the left menu. 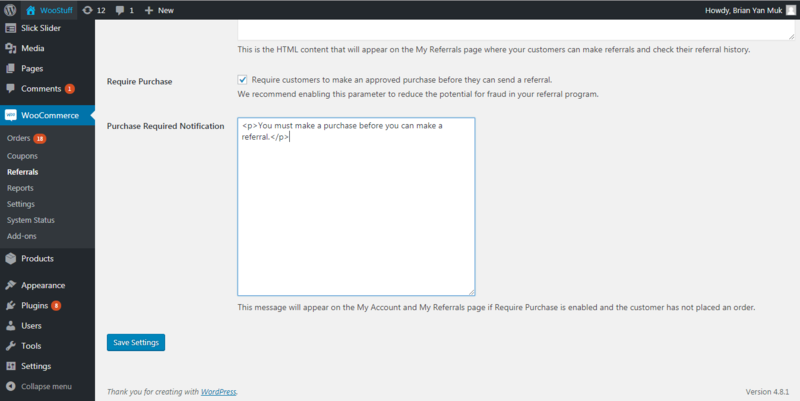 Find the Require Purchase section and check the box to require customers to have made at least one purchase before they can send a referral. You'll also want to review the message to show to customers if they try to refer without having made a purchase from you previously. Click Save Settings at the bottom left of the page. Uncheck the box to make it so anyone with a My Account on your store can send referrals.